Biosleep is a special formula composed by natural products traditionally used as sedatives which act together with this aim. 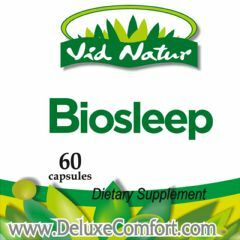 They help to fight stress Biosleep is used in cases of insomnia to conciliate the dream and to rest suitably. Diverse studies have demonstrated that the extract of the leaves of the Bixa Orellana are also effective anti-bacterial and fungicidal agents.At the University of Waterloo (Canada) preliminary studies have shown the extract of Bixa Orellana has proven successful against gram-positive germs B. subtilis S. aureua and S. faecalis); as well as E. coli S. marescens C ndida utilis and Aspergillus niger. The minimum inhibited concentration of the extract was of 4-16 mg/ml while the germicidal activity was markedly higher at 16-64 mg/ml.Clinical studies carried out in Peru conclude that Bixa Orellana has been effective in treating Clotrimazol; as well as Gardenella vaginalis Trichomoniasis and to a smaller degree candida albicans all sexually transmitted diseases.